As I write this I am one hour and eleven minutes into my thirty sixth birthday. By the time you are reading it though I imagine it is quite a few days after this fabulous day. Note the coffee in the background? I should quite possibly be in bed but sleep eludes me at the moment. Or perhaps it is more a case of I refuse to give into it. Which is a bit silly because I am supposed to have a rather action packed day ahead of me. Birthdays are a super exciting event in our house. Though I imagine that to be true in most households. Age has always been but a number to me so I have no qualms about getting older. In fact in some ways I quite like the idea because with age comes experience and knowledge. Two things I have always longed for. Having said that though I do have a few reservations this year. All of which revolve around the silly blood clot in my arm. I can't help but feel that I am still too young to have such a thing. The fact that there is still no real explanation concerns me. The fact that one possible explanation is some obscure type of breast cancer concerns me even more. Concerns however that will hopefully be alleviated Monday when I have my long awaited ultrasound. When I say long awaited I mean less than a month but it feels so much longer. You see I haven't really mentioned it too much here, for fear of being called out on my stupidity. But I have this crazy crazy fear of being diagnosed with breast cancer. With it's terrifying odds it feels like such a possibility. Mind you having just gone and read through that statistic page I just linked to I am currently feeling a little better about it all. My wonderful doctors, have assured me that the ultrasound is just to give me peace of mind. After a good feel a few weeks ago the specialist is certain that the bumps I can feel are perfectly normal. All part of the monthly cycle and related purely to hormones. Sitting here with breasts tender than I can ever recall I struggle to find comfort in their words. However if there is one thing that I have witnessed from all the courageous women I have witnessed battle this awful disease, it is to live life to the fullest. Get out and make the most of not just each and every day, but each and every moment. Which in many ways is why I am sitting here typing away now. Making the most of the peace and quiet before me. The fact that sitting up meant I could get all the washing out of the way may also have had something to do with it but at least there shouldn't be any arguments from Zany about not having any clothes to wear. Bless her little heart. She is quite taken with wearing skorts. In fact it is all she has worn for around two years now. Only she is on the cusp of the dreaded size change over in clothes and apparently skorts are no longer available in her size. The onset of winter does not make things easier either. For now though the urge to sleep has just about reached the point where I can no longer resist. Which is a good thing. I had hoped to be up early for a run. I like to start my birthday day with a run. Since we are planning on spending the day at the Wave Pool though I may forgo the run for a bit of extra shut eye this year. Happy birthday! Hope your birthday brings you good news in terms of the ultrasound....take care! It sounds like you are on a slow bus at the moment, waiting for a result and unable to rush it, but I love your conclusion about getting out and living life to the fullest! I hope you have/had a lovely birthday and a good sleep :) All the very best for Monday. and I forgot to add HAPPY BIRTHDAY!!!!!!!!!!!!!!!!!!!!!!!! I think it's going to be a great year for you. 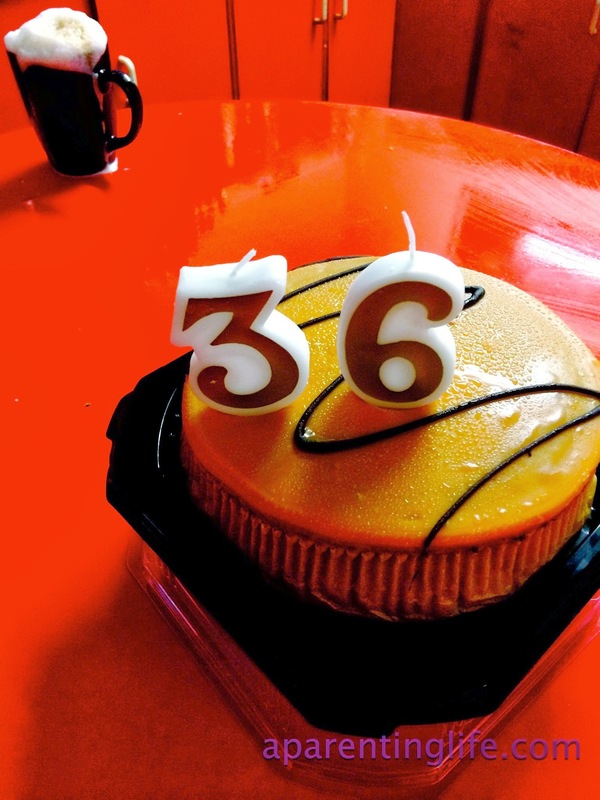 36 is a good number. Nice and even and also a square number which makes me a little happy even if it does mean I'm geeky. Plus you have your awesome trip coming up. Things are just going to get better from here. Here's hoping you get some answers and some good news soon! Happy birthday my friend. I hope it is your best year yet and that you get some peace of mind soon! Happy Birthday Rhianna. I hope that Monday bought you good news. Happy belated birthday Rhianna! I wish you all you desire but good health first.